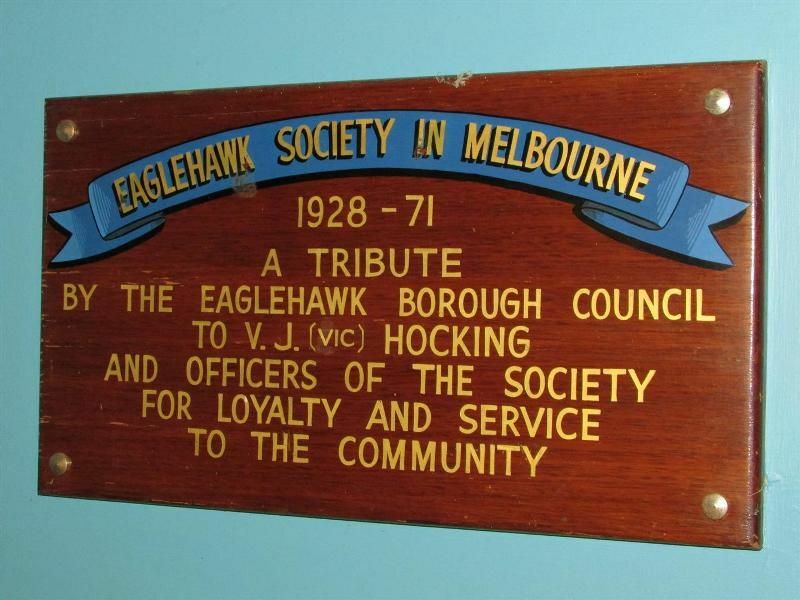 Plaque erected in tribute by the Eaglehawk Borough Council to Vic Hocking and officers of the Eaglehawk Society in Melbourne for their loyalty and service to the community. Born in Eaglehawk circa 1895 Vic Hocking loved sport and particularly football as a young lad at school. He gained employment as the assistant Town Clerk for Eaglehawk; a position he held for 12 years and would virtually spend his entire career working in administration. In later years Vic with his involvement with the Eaglehawk / Melbourne Society presented a Mayoral Chain to the town of Eaglehawk which is still in use today being worn by the current mayor at official functions.